1.0.0.1 YeaDesktop Verification Code is a bothersome adware program. It is the 1.0.0.1 version of the infamous Yea Desktop adware. Many people have encountered a problem when trying to uninstall it via Control Panel. Besides, research shows that it mostly attacks Indian and Chinese computer users. 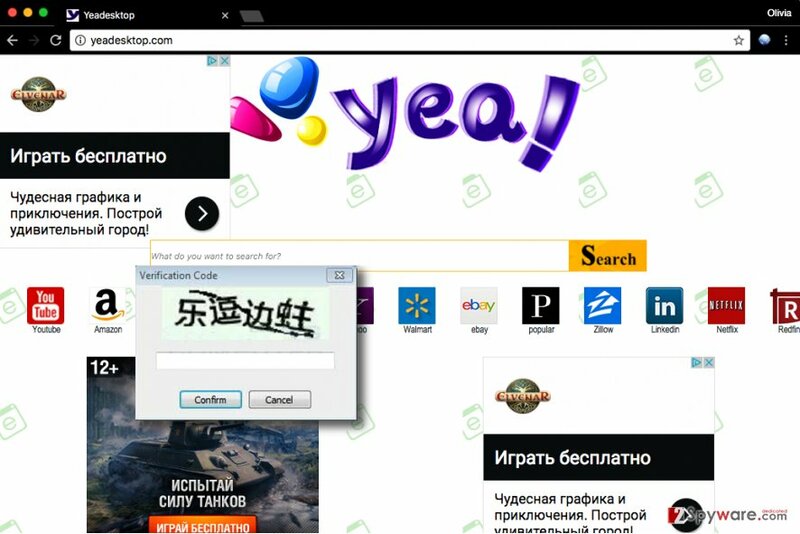 The adware asks to enter a verification code that is written in Chinese characters, which prevents the user from uninstalling it. In this article, we will describe how to remove 1.0.0.1 YeaDesktop Verification Code virus and why you should do it ASAP. The indicated adware is set to communicate with xiaobingdou.com site and display any kind of content loaded from it. This way, the adware delivers ads, pop-ups and causes redirects to various third-party websites. Ads by YeaDesktop are highly untrustworthy and what is even worse is that the described adware can set YeaDesktop.com as default start/new tab page in all of your web browsers. This search page is full of ads, and it instantly redirects user’s searches to popular123.com search engine that mainly serves sponsored search results. Cybersecurity experts do not advise using it as these results might link to highly dangerous third-party sites. Some of these might try to convince victims to install new programs or browser add-ons that can pose a threat to one’s privacy or simply annoy the victim to death. Needless to say, this ad-supported software is extremely untrustworthy and seeks to provide sponsored content not only in the form of pop-up ads but also as search results. Clearly, it hardly endorses or cares about the reliability of content that it promotes since it only cares about pay-per-click revenue. 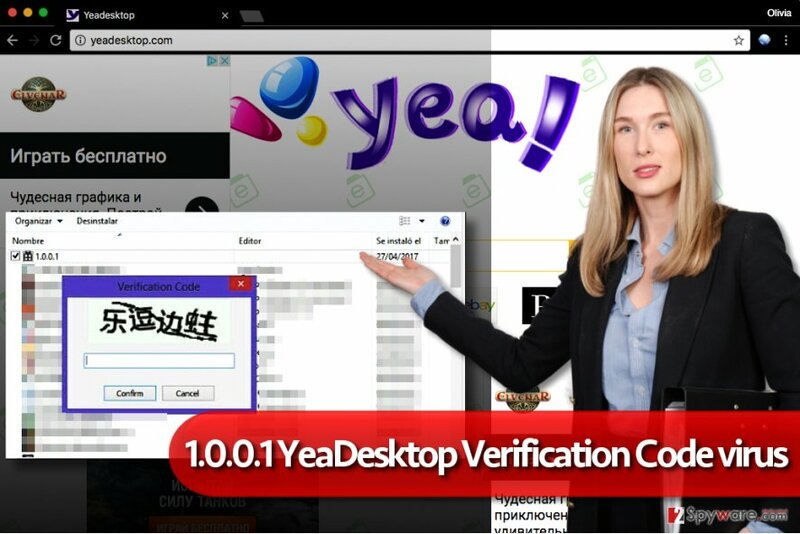 Users find it hard to uninstall 1.0.0.1 YeaDesktop because of the "Verification Code" pop-up that shows up and requires the user to enter a suspicious word/phrase in Chinese language. If you do not want to use a computer compromised by this suspicious spyware program, get rid of it as soon as you can. Unfortunately, users who attempt to do it often face a barrier that prevents them from completing 1.0.0.1 YeaDesktop verification code virus removal. However, the issue can be solved quite easily. You can delete the program manually or use anti-spyware software like Reimage for that. You can get infected with this annoying adware by installing unwanted software in a rush. If you tend to choose Default/Standard settings to install new downloads and if you do not check information written in fine print, then there’s a high possibility of getting infected with a similar spyware type program. Please pay close attention to the information provided by software installers. Also, tend to switch the installation settings from Standard/Default/Basic option to Custom or Advanced one. This way, you will get access to the extra components bundled with your download, and then you will have the chance to prevent their installation. All that you need to do is to deselect suggested extras one after another. You will need to delete certain folders on your computer to remove 1.0.0.1 YeaDesktop verification code virus entirely. If you think that this task will be too hard for you, you can always employ anti-spyware or anti-malware program and let it delete the spyware for you. However, we strongly suggest that you try these 1.0.0.1 YeaDesktop verification code pop-up removal instructions provided by our team. They will guide you through the adware elimination process. First, go to Local Disk C. Then, access Program Files (x86) folder. Here, find and delete YeaDesktop folder. Make sure you have Administrator's rights before deleting the folder. Then, use the guide provided below and delete 1.0.0.1 and YeaDesktop remains from Programs and Features list as shown in the example below. Also, check browser shortcuts to see if there's no suspicious links in the Target field. Here, look for 1.0.0.1 YeaDesktop verification code or any other recently installed suspicious programs. When in the new window, check Delete personal settings and select Reset again to complete 1.0.0.1 YeaDesktop verification code removal. Once these steps are finished, 1.0.0.1 YeaDesktop verification code should be removed from your Microsoft Edge browser. Get rid of each Firefox add-on that was added to the browser without your knowledge. Here, select 1.0.0.1 YeaDesktop verification code and other questionable plugins. Click Remove to delete these entries. Now you will see Reset Firefox to its default state message with Reset Firefox button. Click this button for several times and complete 1.0.0.1 YeaDesktop verification code removal. Delete every Chrome extension that might be associated with the adware that you are trying to remove. Here, select 1.0.0.1 YeaDesktop verification code and other malicious plugins and select trash icon to delete these entries. Click Reset to confirm this action and complete 1.0.0.1 YeaDesktop verification code removal. ^ Wubingdu. Wubingdu. 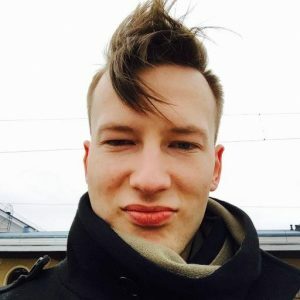 Computer Security News and Tips, Malware Removal Guides. This entry was posted on 2017-07-11 at 08:25 and is filed under Adware, Viruses. How did you remove 1.0.0.1 YeaDesktop verification code virus?